REST API can be used on OCI for automation and presentation. I find presentation for JSON results from CLI on server is UGLY. Finally, I found POSTMAN which does to very nice job of presentation. 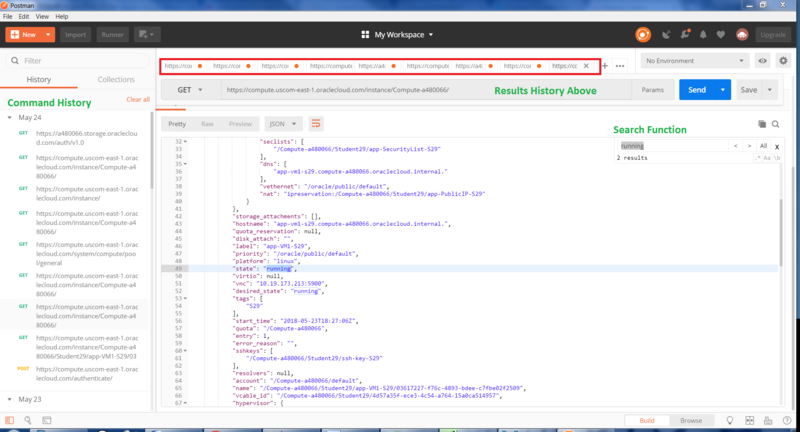 POSTMAN has results history, command history, search function. however, target was not able to consume the data since GoldenGate process would ABEND. Unfortunately, I cannot provide all the details but high level. Position 18)Key Column identify column is Primary Key; hence, ID a primary key column. I labeled each column using the alphabet for reference and R is the 18th letter of the alphabet. For database, NLS_LENGTH_SEMANTICS=BYTE; hence, 800 characters should equal 800 bytes. as it is not able to handle multi-byte. Goldengate reporting has to be the least implemented functionality until it is needed and often in hindsight. Here is an example of what I would normally implement. If business only cares about monthly data, then would not make sense to collect daily nor would it make sense for business to request such. 2) Create a temporary filesystem with dbms_dbfs_sfs.createFilesystem in the new tablespace. 4) The dbfs data is now in the smaller NEW tablespace. 6) The OLD original tablespace is empty now. 7) Create a temporary filesystem with dbms_dbfs_sfs.createFilesystem in the OLD ORIGINAL tablespace. 9) The dbfs data is now in the smaller the ORIGINAL tablespace. 11) The NEW small tablespace is empty now and can be dropped. b) Change LOB retention to none. After countless discussions, team found GOLD. I created an imperfect plan at first that might have saved me from a major catastrophe. Create DBFS_TMP in a separate Disk Group since I was concern existing may not have enough storage. Reorg from DBFS_TS to DBFS_TMP (bad idea to name tablespace as DBFS_TMP as LOB Segments migrated here). Reorg from DBFS_TMP back to DBFS_TS. There’s 29G difference between old and new. How much if this space will be reclaimable due to HWM in data file? Performing reorg twice is really not an option in prod. This has only been tested in a vacuum (non-prod env w very low activities) – YMMV.